The Andaman and Nicobar Islands are part of India and define the Andaman Sea. She is home to indigenous peoples, ancient rainforest and some of the best diving anywhere. The islands of Palau offer world class diving year-around. Highlights are clear, blue water. Cave and wreck diving. Sharks are protected by law. Current diving is awesome. Indonesia's 17,000 islands offer some of the best diving in the world. The Coral Triangle is the most biodiverse place on the planet. Komodo National Park and Raja Ampat World Heritage are world famous. The Philippine Islands offer a treasure-trove of beautiful islands and offshore reefs, with both macro and big animal diving all year around. It's famous for whalesharks and dugongs. Burma's Mergui Archipelago lies just north of the Thai border. Her hundreds of islands and rocks give us amazing diving from November until April each year. Black Rock is famous for oceanic manta rays. A favorite of divers from all over the world, the Similan Islands offers beautiful diving at a relaxed and friendly pace. Destinations include Richelieu Rock and Tachai, famous for mantas and whale sharks. Siam Dive n Sail has been the leading provider of Southeast Asia diving travel and liveaboards since 1996. We’re based on the beautiful resort island of Phuket, in Thailand, Southeast Asia’s premier tropical playground. Co-owners John Williams and Bent Posejpal are veterans of more than 35 years in the diving business (each), and are experts on diving in Thailand, Mergui and the Andaman Islands, as well as other popular areas in the Asia Pacific Region. John has authored or co-authored four books on diving in the region for Lonely Planet, Periplus. Dive Asia, and Times Edition. 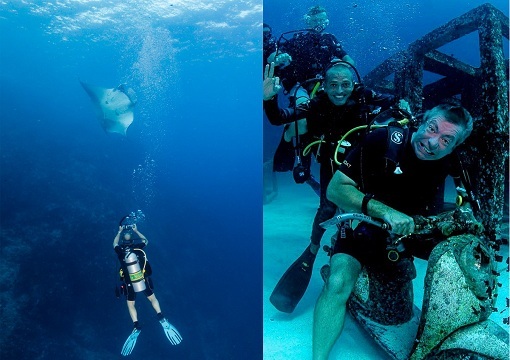 Bent is a PADI Course Director who has trained well over 1000 instructors since 1994. He offers instructional level (IDC) training in Phuket every month.